For quality-built, USA-made mailboxes shipped direct to your office or home anywhere in Michigan, look to U.S. Mail Supply. 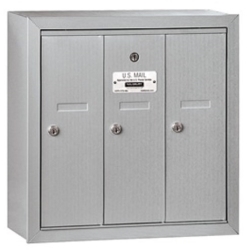 We carry steel and aluminum mailboxes for indoor and outdoor use. Wall mount, recess mount, pedestal mount—we have all types. 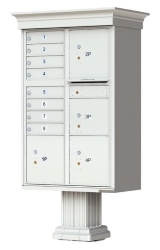 Whether you need a small pedestal mailbox or a large bank of recess mount mailboxes for a dormitory or office, U.S. Mail Supply has it. U.S. Mail Supply carries both USPS approved and private use mailboxes for office buildings, apartment complexes, municipal buildings and government offices. 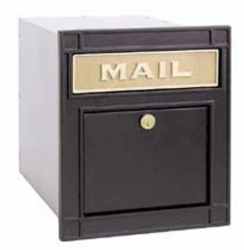 Modern style pedestal mount mail box units or decorative mail boxes, we have them. 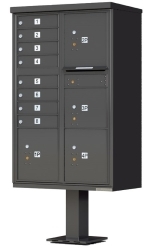 U. S. Mail Supply has a great selection of USPS approved STD-4C horizontal mailboxes, as well as 4C pedestal mailboxes for private use – perfect for university dormitories, barracks and other internal mail delivery systems. If you want the postal service to deliver to your property, the first step is to order USPS approved mailboxes. U.S. Mail Supply stocks a huge selection of USPS approved indoor and outdoor mailboxes for commercial properties, municipal buildings and multi-tenant buildings. 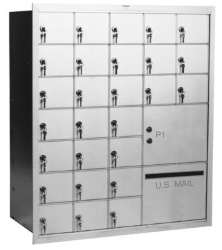 U.S. Mail Supply carries everything from basic wall or recess mount indoor mailboxes to decorative pedestal mailboxes for placement outside of multi-unit buildings. You can even customize your mailboxes with optional package-sized compartments. Pedestal mailboxes and mail kiosks are commonly installed on commercial properties, but many homeowners (especially those who work from home) are adding drop boxes to keep packages safe from porch pirates. Look to U.S. Mail Supply for the best selection of USPS approved and private use mailboxes. Indoor mailboxes can be configured in many different ways, with customization options for different mailbox sizes, front or rear loading, the number of slots, and even a large package holding box. U.S. Mail Supply can help you configure the arrangement that works for your space. Just let us know what you need. 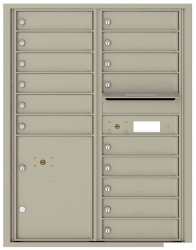 Whether you’re looking to replace the tired old plastic mailbox at the end of your driveway or need a wall mount mail drop, U.S. Mail Supply has the heavy-duty, quality-built, US-made mailboxes you need. 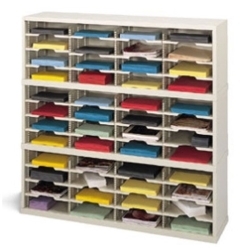 These heavy-duty mail sorters and literature organizers are a great way to keep mailrooms, offices, classrooms and municipal buildings from turning into chaotic messes. If you deal with a lot of mail or product literature, you need a sorter. Michigan winters can be rough, to say the least. You have to be tough to survive in this climate, and so does your mailbox. That’s why we only carry steel and aluminum mailboxes, all built in the US by companies that have been building mailboxes for many years. When you buy mailboxes from us, they’re likely to be the last mailboxes you have to buy. Choosing mailboxes for a limited interior space requires customization – which means poring over hundreds of possible configurations to find something that will work. Thankfully, there’s an easier way. Just use the appropriate form below to submit some details on what you need and our design assistants will work up a rendering showing how your mailboxes will look and what it will cost. 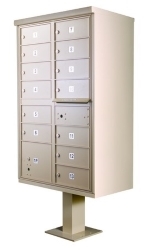 If you need additional help choosing the right mailbox configuration, just give us a call at 800-571-0147.